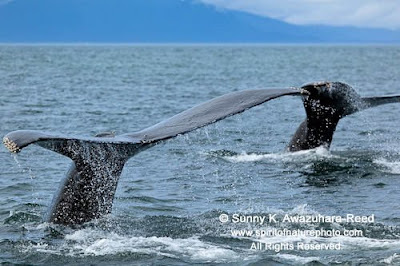 Thousands of humpback whales spend their time in Southeast Alaska during the short summer. They give birth in the South Pacific includes of Hawaii and also travel through Mexico during winter, and then migrate 2,800 miles north for feeding in Southeast Alaska. I've been seeing many humpback whales since I arrived in Glacier Bay. I was paddling a kayak in a cove one afternoon and I saw a mother whale and a calf sleeping on the surface. Slowly, I was paddling toward the whale but they never moved. The huge smooth bodies were floating on the water...I could almost touch them! 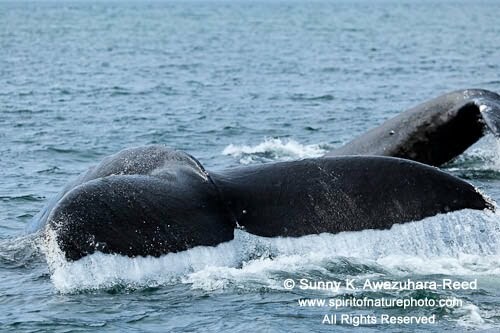 They were much larger than the double kayak which I was in! It was a peaceful moment for a while. 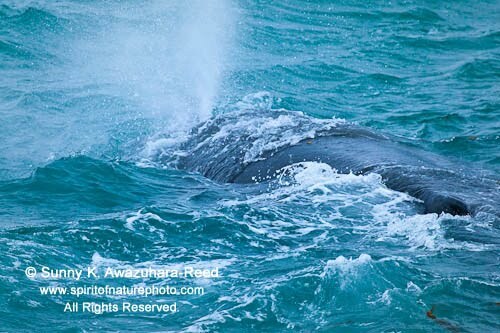 Then, mother whale suddenly blew water, and the calf slowly woke up too. 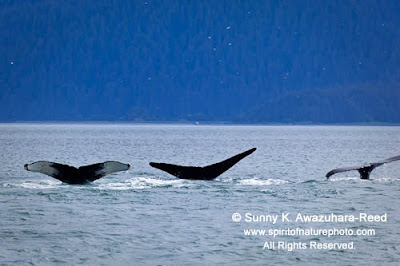 They gradually swam in the other direction... Then, the calf showed it's fluke and disappeared into the deep. 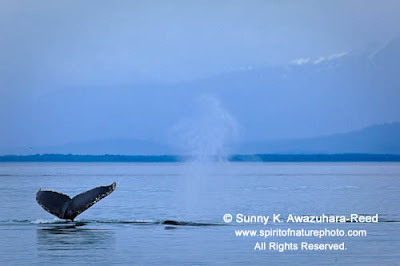 On another day, when I was on a small boat, a humpback whale came close to the boat. Suddenly, it breached in front of me! 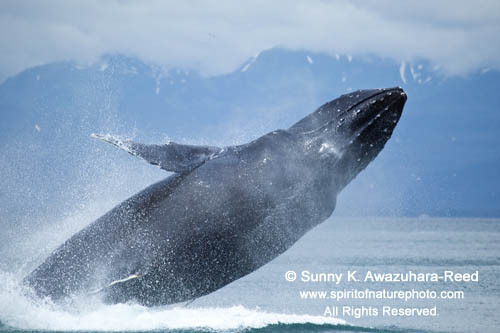 The whale's whole body leaped above the water with a roaring splash! It was only a short second, but a magical moment. I couldn't believe what I saw, but I caught the moment in my camera. 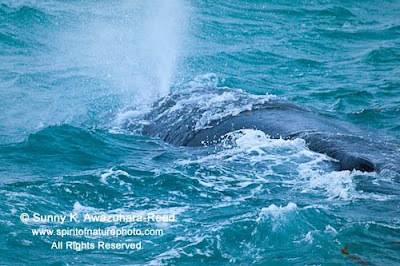 Breaching can be for communication amongst the whales, but the true reason is still a mystery. 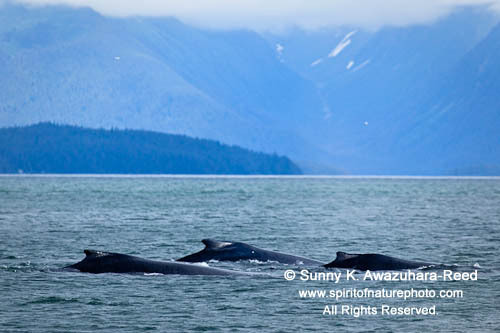 Humpback Whales often feed in groups in Southeast Alaska. 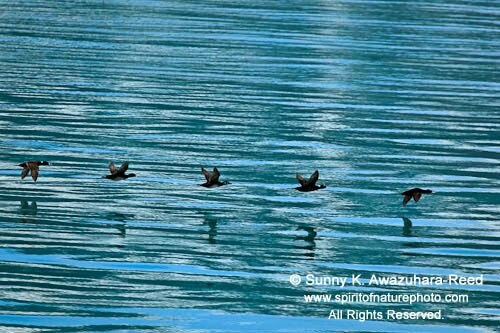 When they swim together, it is like watching "synchronized swimming." Greetings from Glacier Bay, Alaska! After 3 weeks of traveling in Southeast Alaska, finally I arrived at my destination Glacier Bay National Park & Preserve at the end of May. 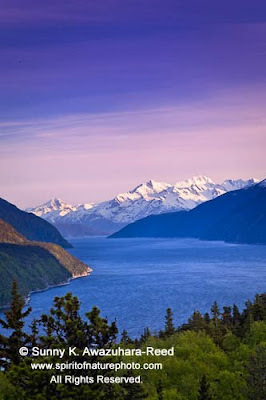 I've been staying in Bartlett Cove which is located near the entrance of Glacier Bay for this summer in order to follow the short season in this spectacular wilderness. 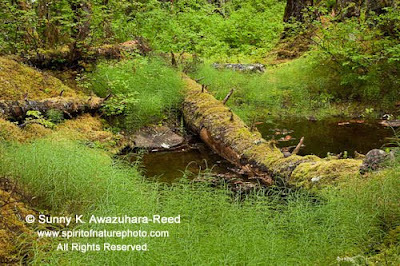 Typical to Southeast Alaska, it rains a lot! Because of the moisture the whole area is covered with thick vegetation like moss covered Sitka Spruce trees, ferns, and thick moss carpeted on the forest floor. 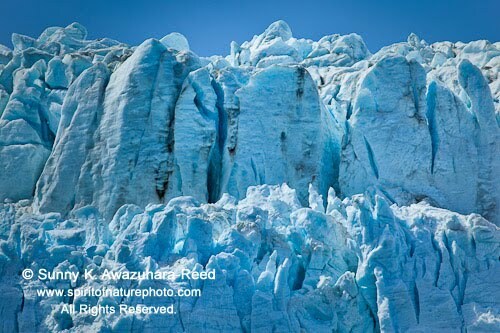 During the Ice Age, Southeastern Alaska was covered with ice. The ice sheet was slowly melted and broke into thousands of glaciers, and those glaciers have been receding. 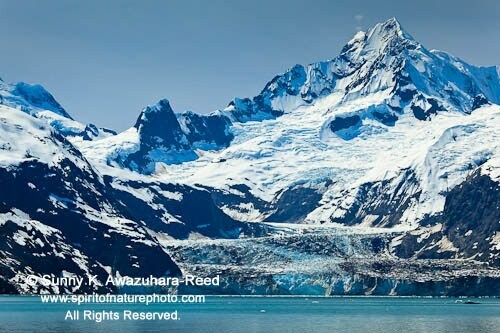 To observe and photograph these magnificent glaciers, I have to go on a boat for 25 miles. One beautiful day, I explored the West Arm of Glacier Bay from the boat. 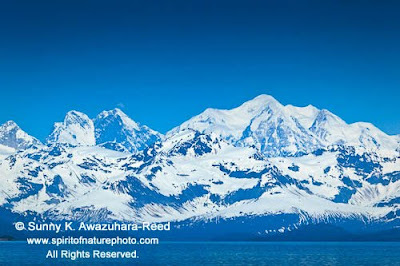 The Fairweather Mountain Range was clear under the blue sky, highlighted by Mt. Fairweather at over 15,000'. 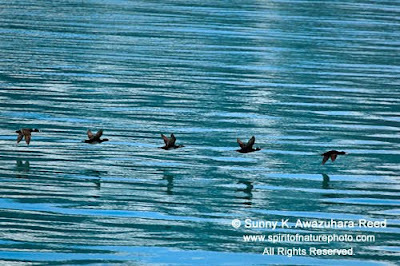 Glacier Bay is rich in marine wildlife and seabirds. Seabirds were following along the boat. 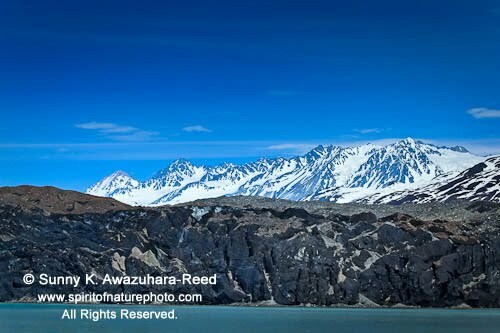 At the end of the West Arm, the Margerie Glacier flows down to the ocean from Mt. Fairweather. The white ice wall is towering! The Grand Pacific Glacier, which has taken up the entire Glacier Bay historically has retreated fast, and now it is covered with the dark colored terminal moraine of rocks and sediment. 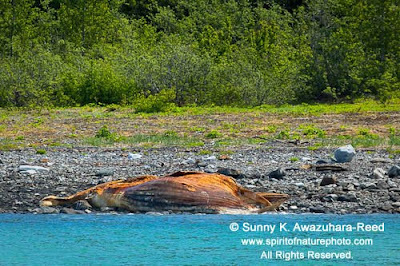 A dead humpback whale was beached on the remote shore... bears and wolves were feeding on it for a long while. Mt. Fairweather from the Bartlett Cove. 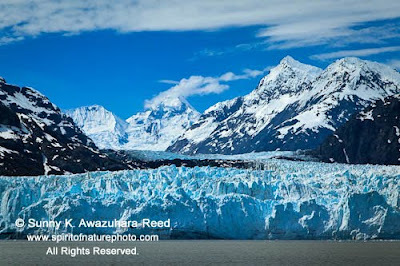 It was a good introduction into Glacier Bay... 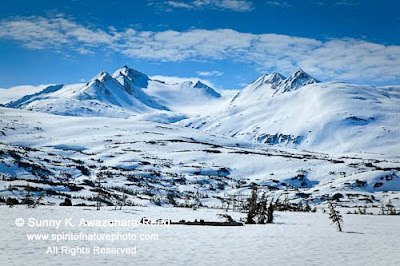 I would like to spend more time at those glaciers. Sailing north from Petersburg on the Alaskan Marine Highway, the ferry entered the most spectacular fjord: Lynn Canal. The glaciered mountains rise from both sides of the channel under the bright sunshine. 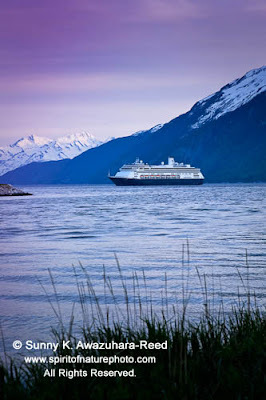 After a full day of sailing, the ferry stopped at Haines, AK, and the ferry arrived in Skagway late in the night. Skagway is the north end of the Inside Passage. With a population of 900, Skagway has a rich history from the gold-rush. Surrounded by the high peaks, the town was built in the small valley. 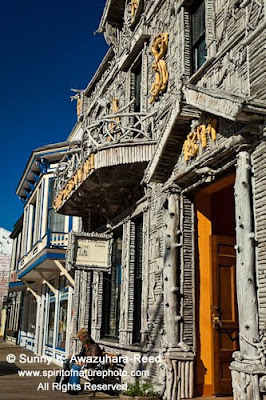 There is a part of the town that is designated as the Klondike Gold Rush National Historic Park, and those gold-rush era buildings are stabilized and preserved in the downtown. Like Juneau and Ketchikan, Skagway is one of the main cruise ship destinations. 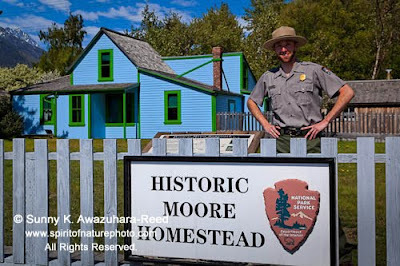 During the busy summer months, the small town is as crowded as Disneyland. During the Klondike gold-rush period, over 30,000 prospectors arrived via steamship boats from the lower 48 as well as overseas to Skagway. 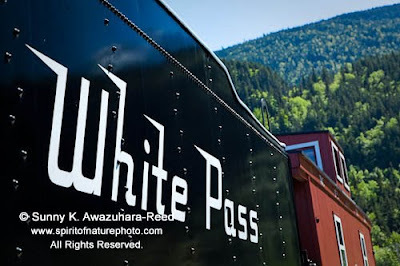 The prospectors marched down to Dawson City, Canada, through one of two trails: Whitehorse Pass and Chilkoot in the harsh winter. Both trails were extremely hazardous. In the Summer of 1900, the White Pass & Yukon Route Railway was completed. However, the gold-rush had already subsided at that time. 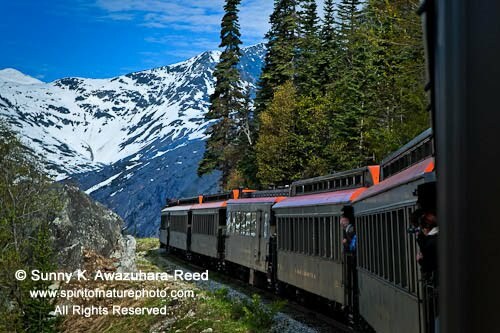 The White Pass & Yukon Route train rides over the scenic mountains are very popular tourist attractions in our modern times. 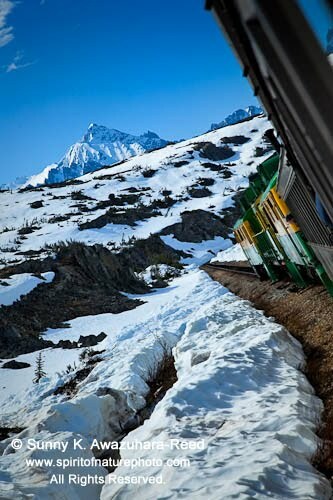 I was on the train on my recent travels while it was full of Canadians on Victoria Day. The train left downtown Skagway at sea level and was soon surrounded by spring greens, and slowly climbed up the pass while I saw snow on the ground. The train went through the tunnels, and I looked down the deep canyon. 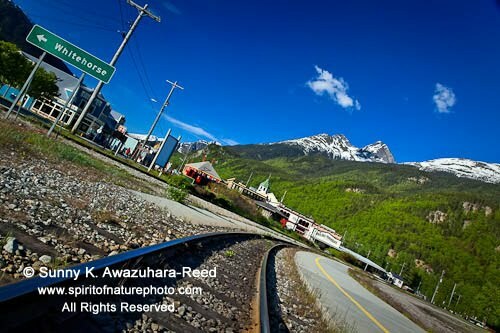 We soon crossed the U.S - Canadian border and entered the Yukon Territory in Canada. 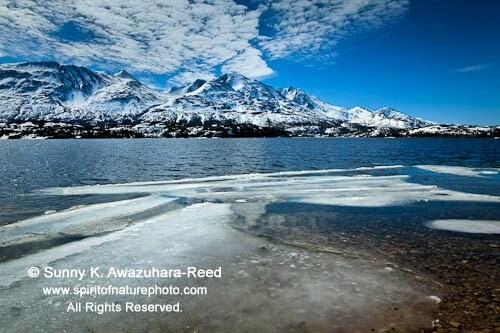 It was still winter at White Pass...snow still dominated the ground, and numerous alpine lakes were still frozen. Arrived in Frazer Lake, and after a very short break, the train headed back to Skagway. Hiking up the steep trail from the downtown, the forest opened up to the Lynn Canal view. The snow covered Chilkat Mountains were painted as soft magenta at sunset. Those large cruise ships were leaving at the time. 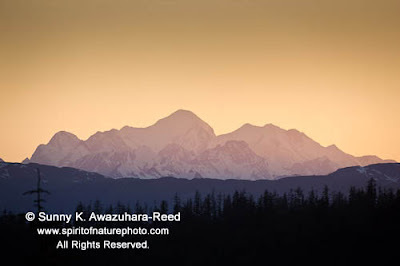 Finally, I was heading to Glacier Bay National Park & Preserve via Juneau, AK. 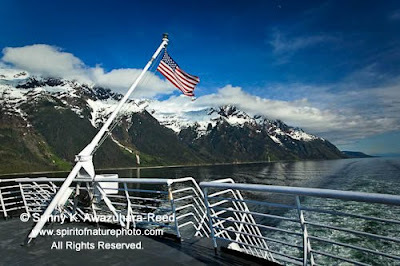 Glacier Bay will be my home for this summer.